Rappers Iggy Azalea and French Montana have sealed their new romance with a kiss while on vacation in Mexico. 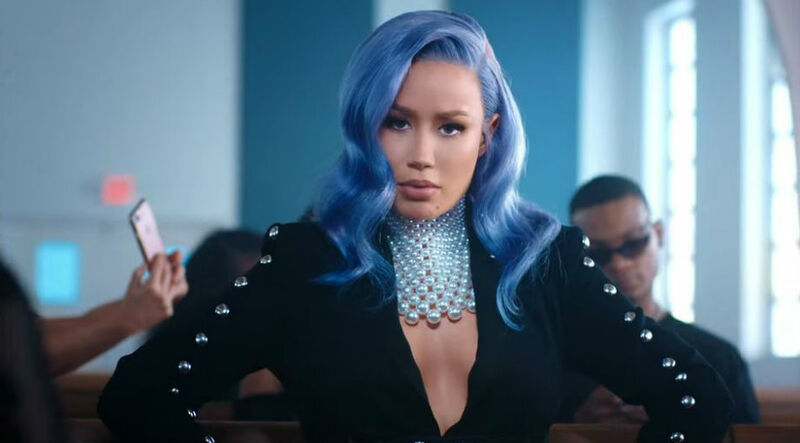 The Black Widow hitmaker first became linked to French in June (16), when they were spotted partying together in Las Vegas, where Iggy was hosting a club night. At the time, the Australian star played down rumours of a romance, insisting they had just been celebrating the completion of a new song collaboration, but they fuelled speculation they are more than just friends at the weekend (27Aug16), when they jetted to Cabo San Lucas together, along with a few pals. The group documented its flight on a private jet on social media, and one video clip featured Iggy dancing in the aisle and playing along as French tried to rest his head on her pert backside. On Sunday (28Aug16), the stars were photographed locking lips while relaxing on a yacht, appearing to confirm their new relationship status. In images obtained by the Daily Mail, a bikini-clad Iggy, 26, perches on the edge of the boat, with her legs dangling off the side, as French emerges from the water to give her a kiss. They were also pictured hugging as he nuzzled her neck. The romantic vacation comes just two months after Iggy broke off her engagement to basketball player Nick Young in June (16), amid allegations of his infidelity. The claims were proven soon after their separation when the athlete's ex-girlfriend Keonna Green, the mother of his son, Nick, Jr., confirmed she was pregnant with the Los Angeles Lakers star's second child. Meanwhile, French, 31, is also no stranger to high-profile relationships - he previously dated reality TV star Khloe Kardashian.